Stock photo of a street scene in downtown Toronto looking downhill on to the clock tower of the old city hall with Lake Ontario in the background. 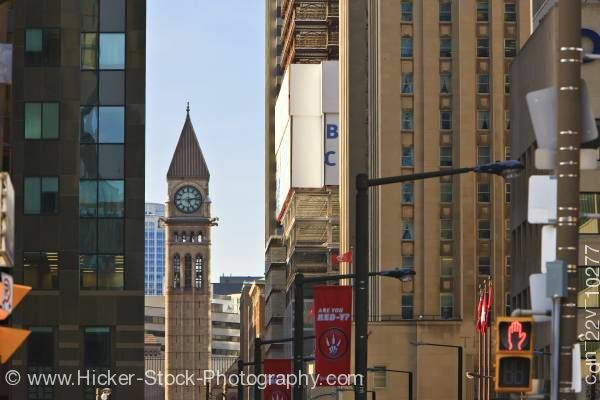 This stock photo is a Downtown Toronto street scene with the clock tower of the old city hall in the background, Toronto City, Ontario, Canada. A vertical section of pale blue sky can be seen behind and above the tower, between tall office buildings, traffic lights, and street signs. All this overlooks sunshine on deep blue Lake Ontario further down the hill in the center of the photograph.